The villa and shop house market has continued to expand over the course of 2014, with healthy off-plan sales levels prompting further development activity. New high quality supply continues to enter the market, with development activity focusing around secondary locations on the outskirts of Phnom Penh. 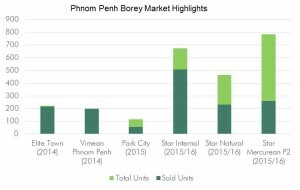 The supply of new ‘borey’ developments has continued to increase over the course of 2014, with predominantly local developers launching sales of projects located in the north of Phnom Penh. The standalone villa market remains active, both in terms of sales and residential leasing. Villas with land plots in excess of 500 sq.m remain a sought-after asset, with investors looking to acquire sites for mid to high-rise developments, due to the shortage of reasonably priced, centrally located vacant land plots. The resale market for existing individual villas remains buoyant, with a steady flow of villas offered for sale in central areas of Phnom Penh. 2014 has seen iconic colonial villas offered for sale, such as The Mansion, an early 20th century residence located behind the FCC overlooking the Royal Museum, currently on the market and ‘No Problem Villa’, located on Street 178, which successfully transacted in Q2, 2014. 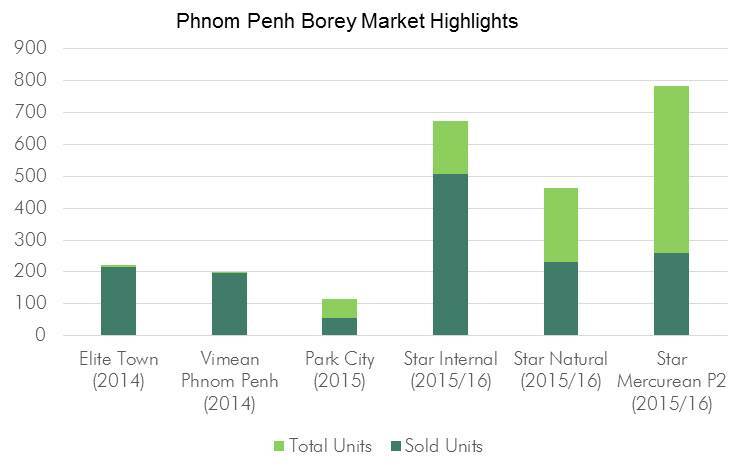 Demand for villas and shop houses within ‘borey’ developments remains strong, driven principally by Cambodian nationals able to take advantage of staggered payment options and in-house finance schemes. Shop houses, comprising upper floor residential accommodation and ground floor retail space continue to be a popular option for Cambodian nationals, due to their relative affordability and the option of using the unit for business purposes in addition to residential accommodation. Off-plan sales rates remain encouraging, with prices ranging from in the region of US$400 to US$1,800 per sq.m, based on Gross Internal Area (GIA) for residential villas and shop houses within ‘borey’ developments.. Achieved rental rates for villas in prime residential areas, such as BKK1, have risen over the past 12, with rent payable ranging from US$3,000 to US$4,500 Per Calendar Month (PCM) for standard sized villas. Overall the demand for villa and shop houses in Phnom Penh remains high, stemming principally from increasing urbanization and rising standards of living. The successful sales rates of recently completed schemes, in addition to projects currently under construction, gives testament to the strength in demand for quality villa and shop house residences. 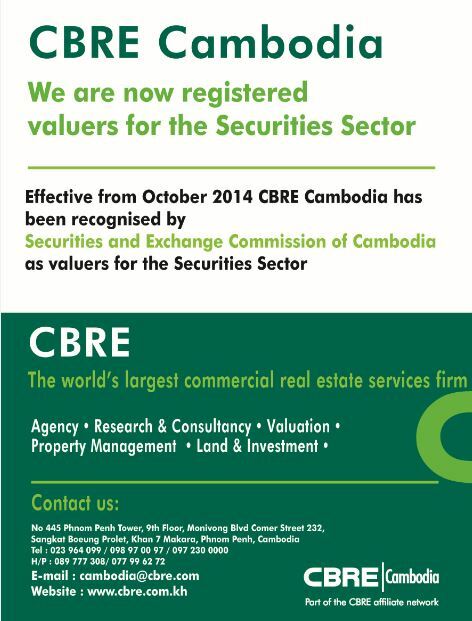 The vast majority of current development activity takes place in secondary locations outside of central Phnom Penh. This is principally due to the scarcity of centrally available land and the high cost per square metre in primary locations. Whilst the healthy rates of sales are positive endorsement of the market, increased development and activity on the outskirts of the city will continue to place greater strain on Phnom Penh’s underdeveloped road and wider transport infrastructure. Whilst off-plan sales are the principal means of disposal, both resale and rental markets, particularly within prime residential areas, remain strong. Over the past 12 months BKK1 has seen the most significant increase in both achieved rental rates and capital values, driven by demand for villa accommodation for both commercial and residential uses and the acquisition of villas for the purpose of redevelopment. Given the location and quality of current pipeline developments, it is likely that strong off-plan sales rates and absorption of developed stock will continue over the course of 2015, with the fundamental drivers of demand, in the form of urbanization and rising standards of living, likely to continue to support both sales rates and the development of new projects in the short to mid-term. Whilst with the volume of future planned projects, due to the increasing popularity of allocating domestic capital into residential development, in addition to the lack of development controls, oversupply remains a risk, it is likely that rising demand will continue support increasing supply through to 2016. Tourist arrivals have grown strongly in Cambodia with an average annual increase of 19% over the past decade. According to the Ministry of Tourism, arrivals between January and August 2014 have risen by 4.2%, when compared with the same period in 2013. The drop in growth rate can be principally attributed to a fall in arrivals by land from neighboring countries, Vietnam and Thailand. The main port of entry for air traffic is Siem Reap International Airport, which has seen an increase of 16.2%, as of August this year, compared to same point in 2013. The significant increase in arrivals by air, attributed principally to tourists visiting sites of cultural interest, bodes well for coastal resort locations, such as Sihanoukville, which could be well placed to capitalize on tourists seeking to visit a coastal destination following visiting Siem Reap. Siem Reap is currently the most popular tourist destination In Cambodia, with the attraction of Angkor Wat supported by a significant variety and quality of available hotel accommodation. Alila Villas Koh Russey, a luxury island development, comprising a total of 227 units, located off the coast of Sihanoukville, broke ground in Q3, 2014. 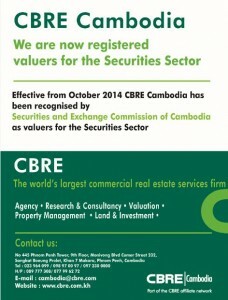 The project is set to deliver a new standard of resort property to the emerging Cambodian market. The project is well placed to further expand on the success of Song Saa Private Island, a scheme of 27 villas that completed in 2013. The scheme launched off-plan sales of the new duplex apartments, which consist of 47 two-bedroom units, in September of this year. Ta Tai Resort completed the first phase of development earlier this year, comprising a hotel, apartments and villas on the banks of the Ta Tai River in Koh Kong. Several prominent developers have plans for large resort schemes, both on the coastline and islands, presenting a range of opportunities for investors seeking to enter the market. With some smaller boutique resorts, such as Akaryn Retreat, delivering 35 pool villas on Koh Krabeay, due to come on-stream over the next 12 months. Under the 2010 Law on Foreign Ownership foreigners can own units in condominiums or co-owned buildings, excluding ground or underground floors, and providing total foreign ownership does not exceed 70%. Islands in Cambodia are not available on a freehold basis and developers have acquired them on a concession from the Cambodian Government, allowing them to develop the island and hold title by way of a long-lease. The majority of coastal and island resort properties are offered on a leasehold basis, as sub-lease of the principal lease. This allows foreign individuals and companies to invest in resort property offerings without the need to establish a land holding company, requiring 51% domestic ownership, as would be necessary to purchase freehold property. There are a number of attractive investment incentives seen on the market, including guaranteed yields for a fixed period, generous periods of annual use for the investor and special discount rates on resort facilities and services. There has been a wide investor interest in Cambodia, with enquiries coming from principally Asian countries, as well as Europe and Australia. Regionally Cambodia is an attractive destination for residents of countries where gambling is prohibited, such as China, Vietnam and Thailand. A number of large scale resort developers have gaming as part of their development strategy and see it as a key future component to attract Asian tourists.